When Profit from the Core was published in 2001, it became an international bestseller, helping hundreds of companies find their way back to profitable growth after the bursting of the Internet bubble. The 2007 global financial meltdown reaffirmed the perils of pursuing heady growth through untested strategies, as firms in industries from finance to retailing to automobiles strayed too far from their core businesses and suffered the consequences. 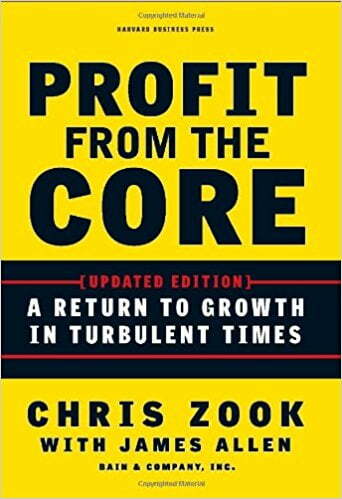 In this updated edition of Profit from the Core, authors Chris Zook and James Allen show that a renewed focus on the core is more critical than ever as firms seek to rebuild their competitive advantage coming out of the downturn—and that a strong core will be the foundation for successful expansion as the economy recovers. 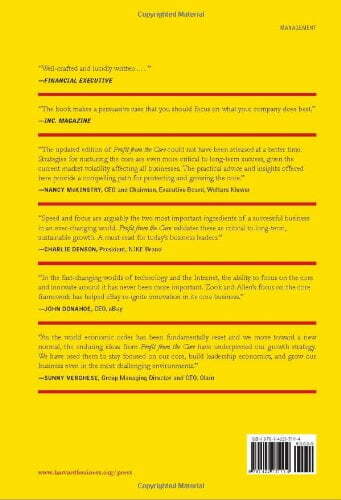 Based on more than ten years of Bain & Company research and analysis and fresh examples from firms responding to the current downturn, the book outlines what today’s executives and managers need to do now to revitalize their core, identify the next wave of profitable growth, and build on it successfully. Building on powerful and proven ideas to meet today’s formidable business challenges, Profit from the Core is the back-to-basics strategy field guide no manager should be without.